Walk a Mile by Sarah Madison: On Sale and Available for pre-order! Okay, I just have to share this with you! 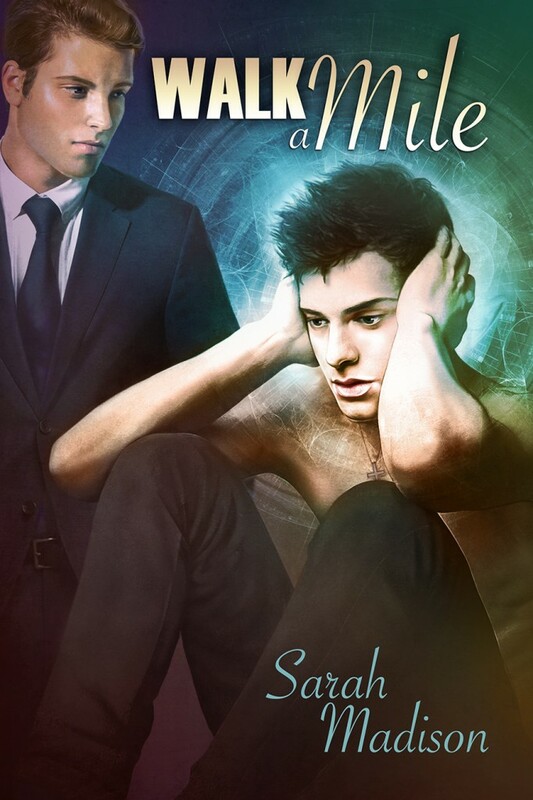 Walk a Mile, book two in The Sixth Sense series (the sequel to Unspeakable Words) is now available for pre-order from Dreamspinner Press! Even better, the paperback version is discounted 35% off from now until Sunday, Sept.21! So not only can you snag a gorgeous copy that you can hold in your hot little hands, but you’ll also get access to the e-book version when you buy a paperback! How can you beat that deal? 🙂 Cover art by Paul Richmond. Not only can you purchase Walk a Mile in paperback at a discount, but Crying for the Moon and Not Quite Shakespeare are also available at the sale price until Sunday–you should check them out! What are you waiting for? Sale ends Sunday Sept 21, 2014! This entry was posted in Uncategorized and tagged announcements, Crying for the Moon, discounts, Dreamspinner Press, promo, Sarah Madison, Unspeakable Words, upcoming release, Walk A Mile, writing by Sarah Madison. Bookmark the permalink. Oh, you’re so LTTP. I pre-ordered this AGES ago. Seriously, I can’t wait for it to come out, even though I have to. I’d been checking Dreamwidth almost daily, just waiting for it to show up. Go you! Carlos would say “Hi, and congrats”, but he’s under the bed right now. Any chance Flynn can drop by and talk to him, and let him know he’s in a safe place? For the record, since you’re a vet, just know Carlos is a Russian Blue. I think Flynn would suggest Feliway–it’s a kitty pheromone that tells cats to chill out and be happy. (No =joke, it really seems to work for some cats–I use a diffuser at the house and I know the day it runs out!) Carlos sounds like a nervous boy. I bet he’s a handsome devil, though! Feliway has been our friend for years, since my Chloe had attachment issues and peed on everything, to remind me that she loved me. RBs are notorious for their nerves and shyness, and he has both in spades, but he is a handsome devil, and worships the ground I walk on. He’s just scared of everyone else. Carlos sounds a lot like my oldest cat, a Siamese cross named Tristan. My friends refer to him as my imaginary cat as I am the only one who ever sees him! Sarah Madison recently posted..Walk a Mile by Sarah Madison: On Sale and Available for pre-order!